The story behind the name: In the ancient Middle Eastern and Mediterranean cultures, the constellation Aquila is seen as the shape of a flying bird. The pattern contains three prominent stars that can be seen to outline the wings of a bird, but are also the focus of quite different myths in eastern and far eastern cultures. In Indian mythology the three stars are said to be the footprints of Vishnu, the god who preserves the universe. 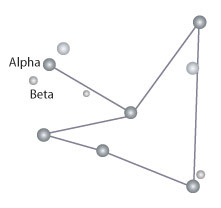 In the mythologies of China, Japan and Korea, Altair, Aquila's brightest star, is part of a myth related to another bright star, Vega, in the configuration known as the Summer Triangle. Altair represents a royal herdsman and Vega represents the Sun king. The herdsman falls in love with the king's daughter and marries her, but they are banished to opposite sides of a "river" (the Milky Way) for being so in love that they neglect their duties. They are said to be able to reunite when birds span the river. The birds associated with the myth are magpies, but may have been inspired by the two bird-shaped constellations, Aquila and Cygnus, that appear in this area of the Milky Way. This love story is still celebrated by a Japanese festival. 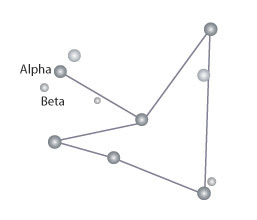 In Greek and Middle Eastern cultures, the constellation Aquila has been identified with a bird since the first millennium B.C.E. The Arabic and Persian names for the constellation and its main stars refer to an eagle and its parts (wings, tail, etc.). The eagle was seen by many ancient cultures as a bird with royal associations and this link carried over into Greek mythology. The eagle is sometimes identified as a servant of Zeus, king of the Greek gods. An eagle was keeper of the the thunderbolts which were Zeus's signature weapon. There are legends of Zeus using the disguise of an eagle, in one seducing Aegina, daughter of the river-god Asopus, in another carrying off the beautiful youth Ganymede, son of King Tros (of Troy), to serve as cupbearer to the gods. Possibly as a reward for its services, possibly as a symbol of his own royalty, Zeus is said to have placed the image of an eagle in the sky.